Marked with firework displays and delicious lip-smacking sweets, Diwali, is a prominent Indian festival celebrated by millions of people across the world. The theme of the festival is the triumph of the good over the evil. Also fondly called as the festival of lights, the festival sees houses decorated with lights, lanterns lit and special poojas performed to display the reverence to God. On this colorful day, we Indians have had a tradition of playing card games for ages. It is not very uncommon to see card games played within family circles as it was always considered as one of the markers of this festival. Deccan Rummy is out there to make this festival of splendor, brightness and happiness even brighter with our Special rummy tournament on Oct 22. Fancy a shot at a big payday? Here is a spectacular tournament exclusively for you. In the zesty spirit of this electrifying festival, we are out there to add more electricity with this super Mega Diwali Dhoom Special tourney. 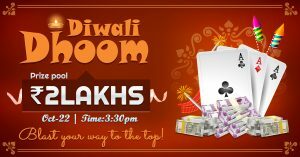 Celebrate this splendid festival with our sparkling “Mega Diwali Dhoom Special Rummy Tournament” on Oct 22 @ 3:30 PM. As Diwali festival runs for 5 days, we are hosting this spectacular tournament on Oct 22, which is a Sunday so that you can play this tournament in the most relaxed manner. 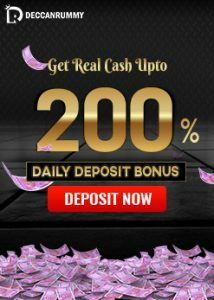 The tourney offers you an unmatched opportunity to win huge cash bonus from the mammoth prize pool of Rs. 200000 cash bonus. How to participate in Mega Diwali Dhoom? Players can buy-in the ticket for the tourney for Rs. 500. Please note, we will NOT be registering you for our Mega Diwali Dhoom tournament when you receive our FREE ticket. In order to register, sign in and register for the tourney on Oct 22 @ 2:30 PM. Early birds who receive the ticket early do not forget to register! To obtain the ticket and register for the tournament you must have an account with Deccan Rummy. If you are a newbie, please go ahead and register for free and follow the above procedures to win a free ticket. We assure you that it will be worth it. With such huge prize money at stake, we expect huge numbers of players to participate in this tournament. Don’t wait till the last moment as the like/share/review process closes by 2:30 PM on Oct 22. 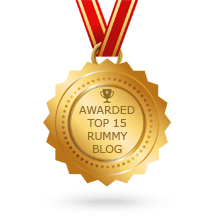 Refer our rummy tips document to hone your skills and come out all guns blazing in this tournament. 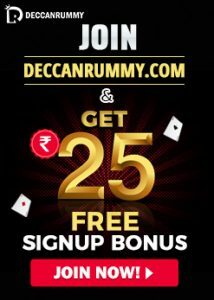 We, at DeccanRummy.com, would like to cordially invite every rummy enthusiast out there to come and play this tourney and win their share! All the best! Advanced Diwali wishes to everyone!